How much memory is enough memory ? I remember the time around 5 years back when I had a system which had only 32 MB RAM. I still have this machine which has since been upgraded to sport 96 MB RAM. But even when this machine had only 32 MB RAM, I was able to install and play games on it, work on a word processor and also browse the internet. In fact, I remember that I was successful in loading X windows with just 32 MB memory. Of course, GNOME took a lo..oong time but a bare bones window manager like twm was quite fast to load. From that time of 32 MB memory, the PCs as well as technology has come a long way. Now PC's come preloaded with atleast 256 MB RAM. Even this is not enough for playing graphics intensive games that are available in the market. Some of the games like Half life (which also runs on Linux) need atleast 512 MB memory to really enjoy playing the game. So the question that is foremost in everybody's mind is how much memory is enough memory ? Toms Hardware has the right article which reviews this very question to give the readers a satisfying answer. The guys at Tom's, review how various memory limits affect the performance of different softwares and graphics intensive games like Quake and Doom, the performance of the two graphics technologies OpenGL and DirectX with different amounts of RAM and so on. The benchmarking was done with 512 MB, 1 GB and 2 GB memory. 512 MB RAM is enough if you run low resolution games or run only one application at a time. Umm... my more recent machine has just 256 MB and I am managing quite well. 1 GB RAM is desirable if you are running more than one application at a time and wish to play high resolution graphics intensive games. 2 GB RAM if you are a hot shot graphics professional or game developer. All in all a worthwhile article which gives a fair idea of how much memory to buy while shopping for a PC. 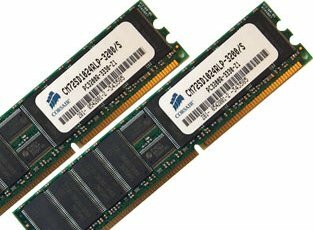 2Gb RAM is also a must if you are running 1 or more virtual machines. I run Xen on my box which allows me to have virtual Linux machines (and soon Windows too with the next generation of Intel/AMD chips) so I have Fedora Core 4 for my desktop domain with 1G allocated to it then a CentOS 4 domain with 512M for my mail server and a CentOS 4 domain with 512M for my web server. This one box replaced 3 other boxes. Soon it may replace my firewall also. I'll just reduce my desktop by 128M or so and create a bare bones CentOS install, load Shorewall on it, and voila. This virtualization stuff rocks and I can see it really driving up the average amount of RAM people install in their boxes. I have always tended to run cheap, older machines with lots and lots of RAM. When you are trying to get real work done, RAM is usually somewhat more important than CPU speed. How many people spend extra to buy a super Ghz processor, but skimp and buy 128 MB of RAM, not realizing that without the RAM, their system can slow by 2 orders of magnitude? I've seen cheezeball < 1Ghz PIIIs handily beat 3000+ Athlons at many tasks simply because they were given enough RAM to do the job efficiently. I have a laptop with a 4200 RPM HDD, and a 1.7 Ghz Pemtium-M chip. with 1.5 GB of RAM, it's typical for me to run 3 or even 4 OSs (a la VMWare Workstation 4.5) at a time, as a mix of Windows and Linux systems, and still have a snappy, responsive system! RAM counts, usually more than CPU speeds in modern systems - make sure you have enough! Well, coming from a Sinclair Spectrum (Timex) with 40 KB usable RAM, I'm now working on a computer that has more RAM than my first PC had harddisk space. The Spectrum/Timex was so limited that only internal Basic, Forth or (better) assembly were the only usable languages. Nowadays, we can bear the enormeous overhead of Perl, Python, GCC and the such with our multi GHz, multi GB machines. Of course, you can never have enough resources. The machine I have now ($1000 beast) is far better than the $125,000 Unix machine I was working with in 1990. That one supported over 50 users with serial terminals! The machine I had before was a 128 MB/600 MHz machine. It ran awfully smooth, far better than the 1 GB/1.7 GHz Windows machine I have at work. It ran VMWare with Windows 98 too to the amazement of those who ran it as a single OS at home! I loved it, because I could write a CDR while doing my internet and toggling the terminal or writing a document at the same time without a glitch. Of course, this machine is capable of doing it too (and better of course). A single window? With 1 GB memory? Even if I got everything running (10-20 windows), I hardly touch the swap partition and allocate less than 128 MB! The only time, I see the swap growing is when I use a memory leaking application! I consider this the turn of time. Time goes by, I buy a new PC every three - four years which is at 4 - 8 times more capable than the previous one. That means my next PC will have at least 4 GB of memory, a single processor of 10 GHZ (or dual core 4.5 GHz or quadruple core 3 GHz) and net 600 GB of diskspace (RAID, I guess). Imagine the kind of programs we'll be using then! P.S. My first word processor, Tasword Two, allowed you to write 16 pages of text in 32 KB. The next one, WP 5.2, needed at least 512 KB. Unheard, that was..! Now I have a cool computer - AMD SEMPRON (socket 754) 2500+ wich I overclocked from 1400MHz to 2000MHz. I have 512MB of RAM and I am too satisfied with my computer. I am using Suse Linux 9.3 and I usually I dont play any games. I too started out using Linux on a P100 w/ 32MB RAM back in 1999. Before that I ran a BBS on a 286 w/ 4MB running Desqview. Then, I was using OS/2 on a 386/40 w/ a 3 node BBS and was able to do what I needed with no problems. This has progressed to a Dual P-III Xeon 500Mhz system w/ 512MB RAM that I run Linux on. I have 256MG RAM in both of my powermacs that run linux as well. RAM is always a better buy than the fastest proecessor, hands down. Bill Gates never said: "Nobody will ever need more than 640KB RAM".. it's about a valid as aids needles in payphones and grandma's drying their cats in microwaves..